On Saturday I woke up very early to catch the high speed train to Córdoba. I had planned to spend the day and wouldn’t be returning back home until around 11:00pm. I woke up so tired and I really felt like I had a learning hangover! My brain is getting so much exercise these days! I fell asleep on the train and woke up in Córdoba 45 minutes later to discover that my internet wasn’t working. Needless to say, my first stop would have to be ‘vonafone’. 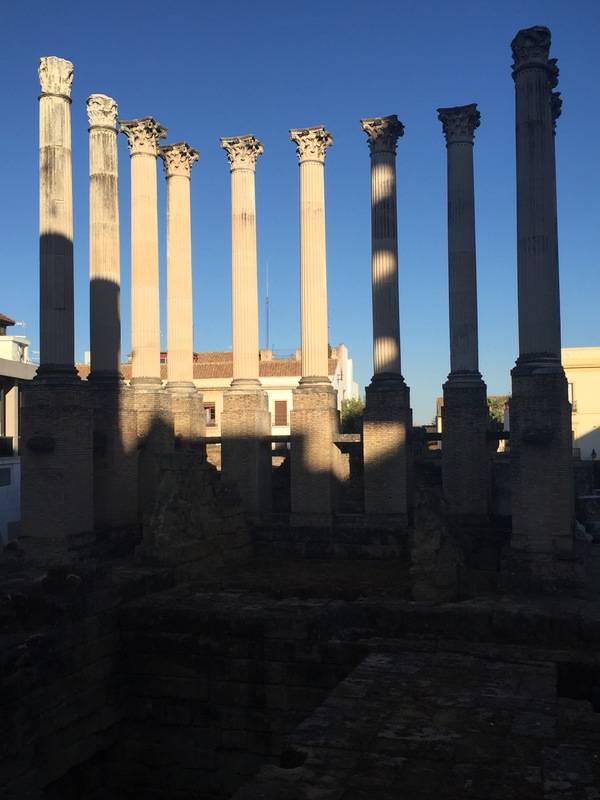 How would I possibly get around Córdoba without my numerous travel apps and without Internet? This was a disaster!! Truly an emergency! I manage to speak enough Espanol, find a paper map in the train station, and get myself to a ‘Corte Ingles’ where I find Vodafone on the 4th floor next to men’s sneakers. This is all so weird, but okay I have no choice! I need the Internet! Corte Ingles is comparable to a Macy’s, for all intents and purposes. While waving around my phone and speaking Spanglish, I manage to convey my HUGE problem to the young Spanish girl behind the counter and 30 minutes later my phone is back in action! This all came as a huge relief! While I am sightseeing, I am on my phone teaching myself history and everything and anything I desire. I couldn’t possibly wait until I get home to do this! 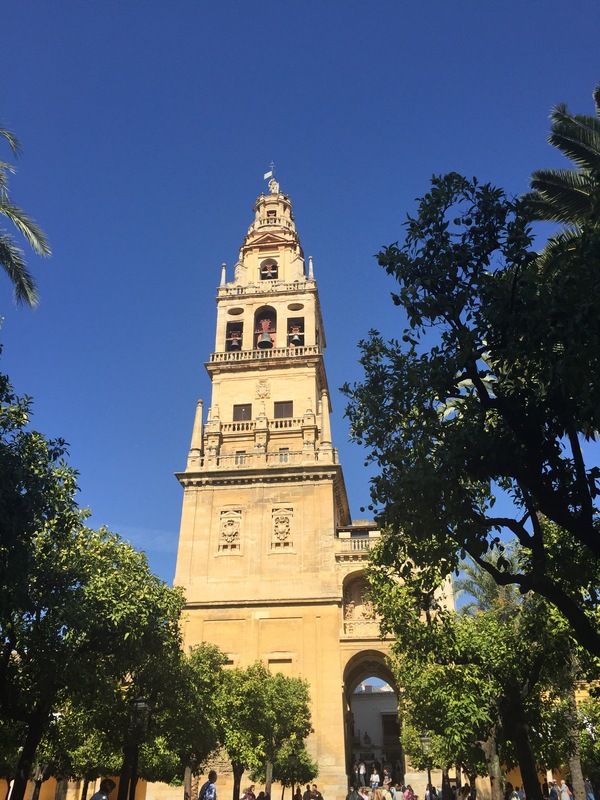 So now that this is settled, I head in the direction (thanks to google maps), of one of the most exceptional monuments in the world-‘The Mosque-Cathedral of Córdoba’. The Autonmous Community of Andalusia is divided into 8 provinces: Almeria, Cádiz, Córdoba, Granada, Huelva, Jaén, Málaga, and Sevilla. And, it is the only European region with both Meditearanean and Atlantic coastlines. As of today, I have been to 4 out of the 8 provinces and I’m determined to work my way through all! 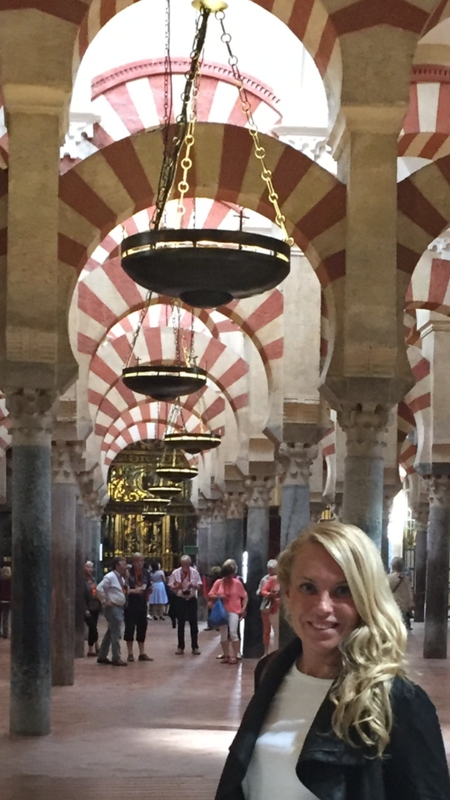 And, Andalusia continues to exceed my expectations! It’s just amazing, really! 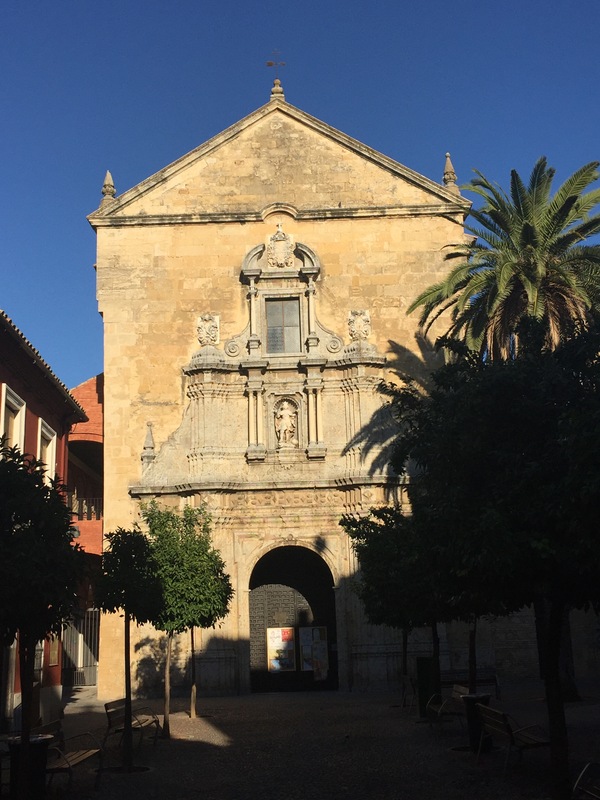 To simplify this whole situation, ‘The Mosque-Cathedral of Cordóba’ is a Mosque that contains a Christian Church. 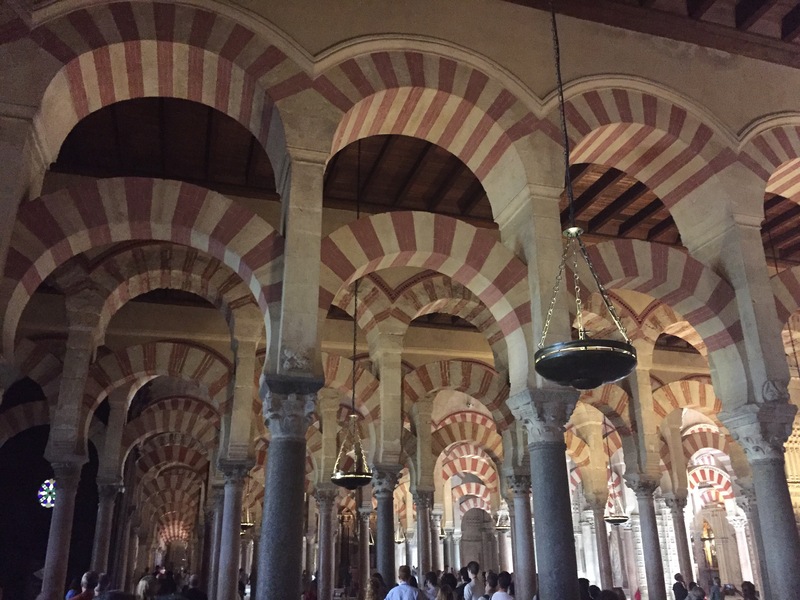 It is an extradronary blend of Moorish and Christian Architecture. Here is a very ill-defined breakdown of how this all went down. First the Romans built a pagen temple. After the fall of the Roman Empire, the Visigoths replaced it with the church of Saint Vincent. Than the Arabs conquered in the 8th century and built their great Mosque. 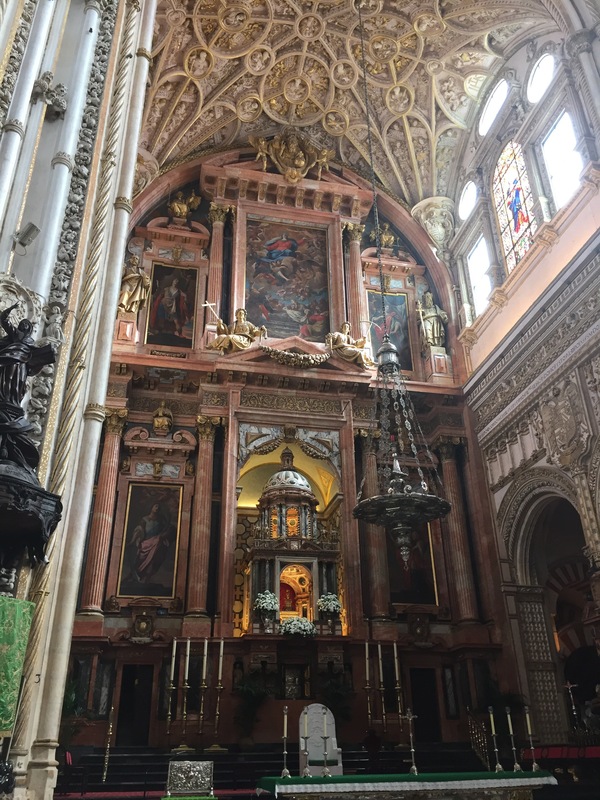 Than the Christians re-conquered Cordóba in 1236, and they did what it is that they do, and instead of bothering to build a new church they simply converted the building to Christianity and put an alter in the middle! This breakdown is painful for me to write because I would love nothing more than to write an entire book on this one subject, however we lack the time and the space. The original Mosque had lots of open arches because it was set up for worship in the shadows of the central area. 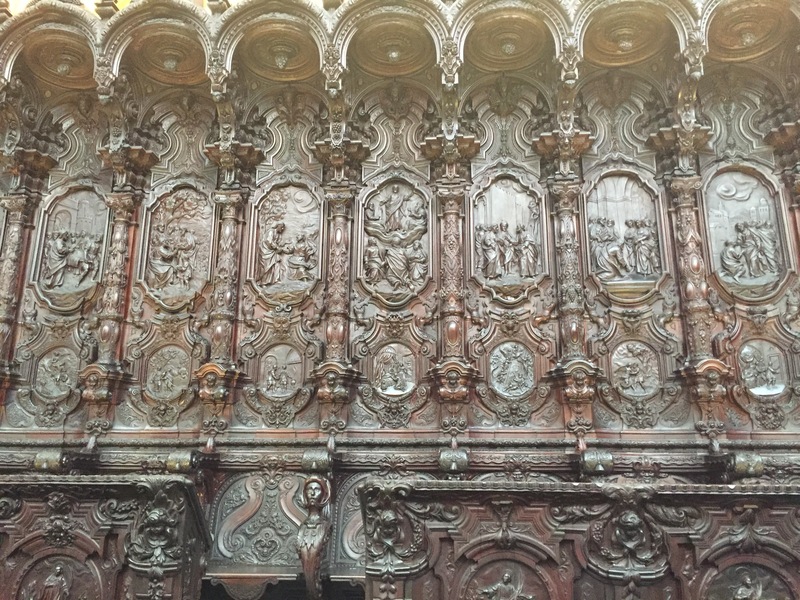 The Christians covered and sealed these openings and are using them for a backdrop for various Saints. 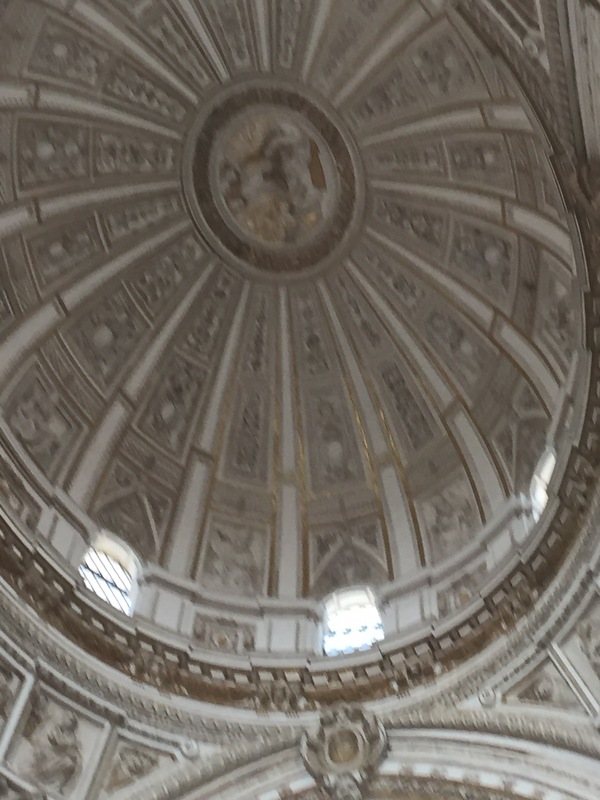 Since the year 1236, without missing a single day, the Chapter has held Holy Mass for the Christian community in this beautiful and magnificent temple. 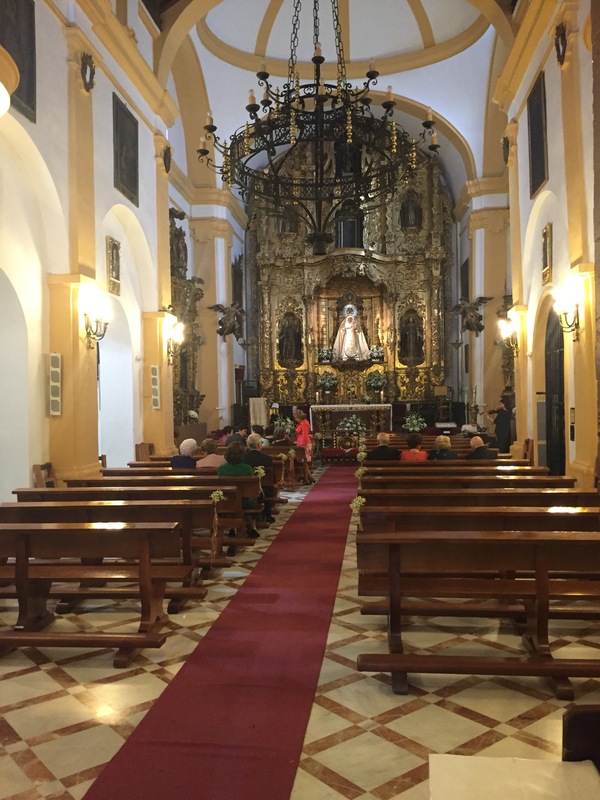 The Catholic people of Cordóba say “I went to mass at the Mosque”! 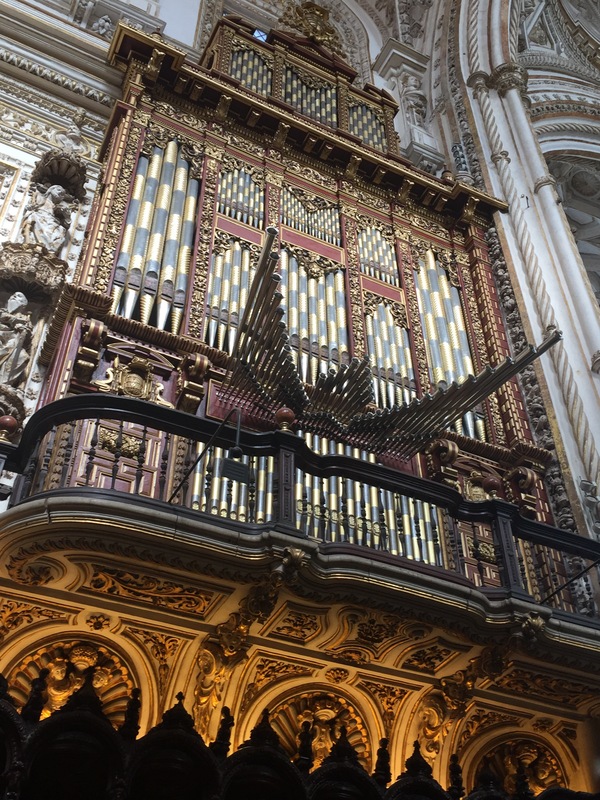 Only in Spain could I imagine hearing this! 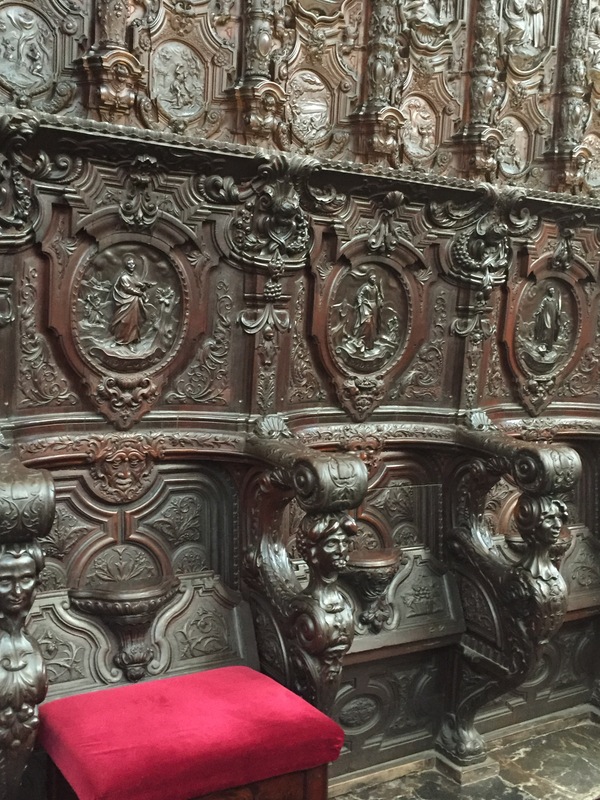 Engraved on the Choir Chairs is The Stations of the Cross-no two chairs are exavtly the same. The Working Organ inside the Mosque. The massive wall surrounding the Mosque. These pictures truly do not do this spectacular massive structure any justice. After spending over two hours walking around and taking it all in, I realized that I was hungry. I left the Mosque in search of some tapas. 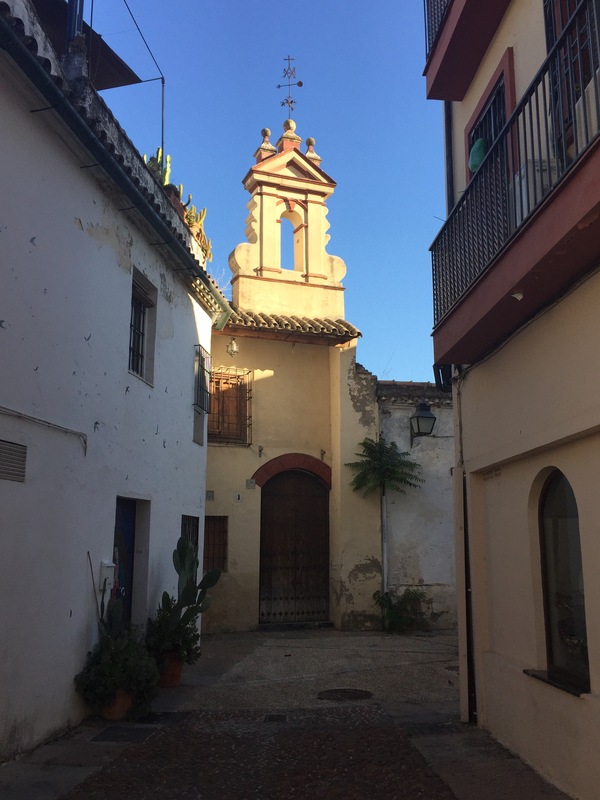 I was walking down a narrow street and turned a corner to look up and find what I soon discovered to be ‘The Roman Temple of Cordóba’. The remains of a Roman Temple that I discovered by an accident. That is exactly how it happened…I was just walking down the street looking for some food and I stumbled upon a Roman Temple!! 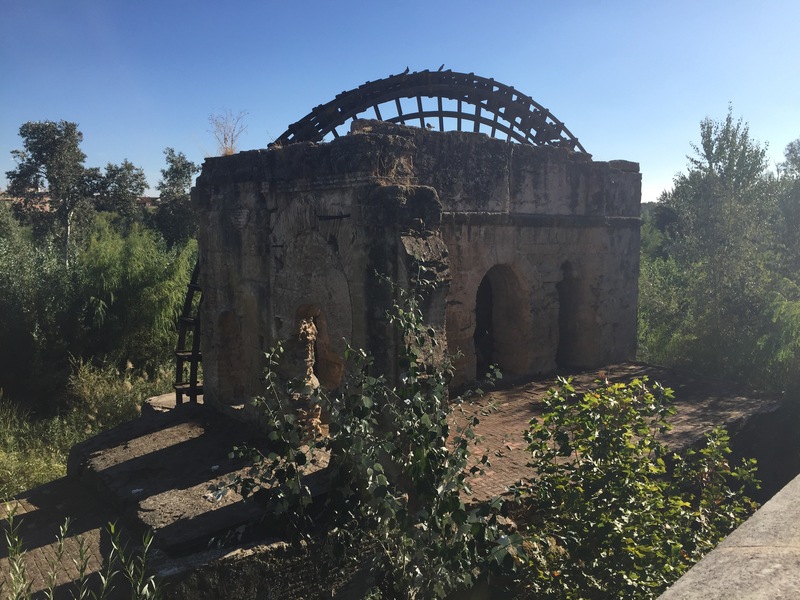 After some research (thank God for the Internet and the little girl that helped me fix my phone), I ascertained that these ruins were discovered in 1950’s during an expansion to Córdoba’s city hall. Come to find out, the temple was built during the 2nd half of the 1st century. 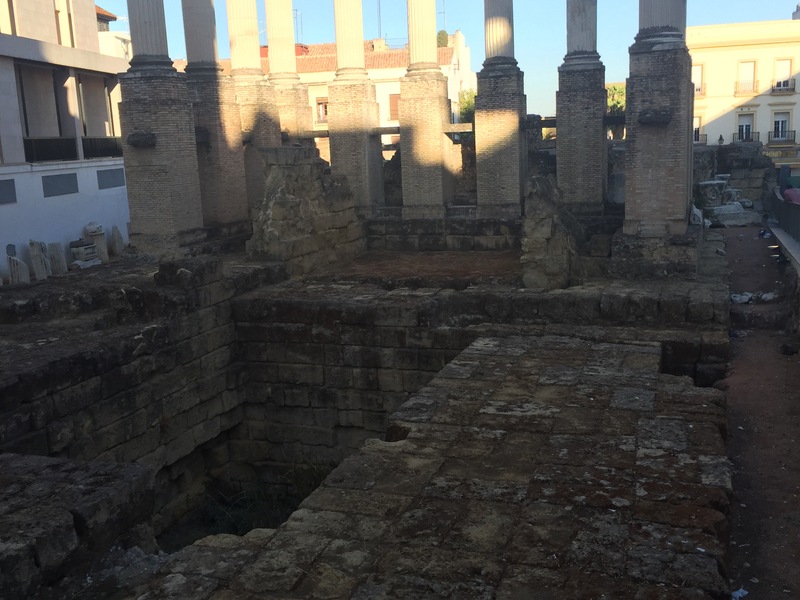 What remains is the foundation, the stairs, the alter and some shafts of columns and capitals (capitals are the top of the columns). The highlight of this set is the foundation which is arranged in a fan shape. This massive foundation tells us the magnitude that the temple could have held! Amazing!! It is said that this temple could have been visible from ‘Via Augusta’. ‘Via Augusta’ was a Roman road crossing all of España named after Emperor Augustus. Again, I could go on and on but you get the idea. Next I was off to explore the Jewish Quarter. 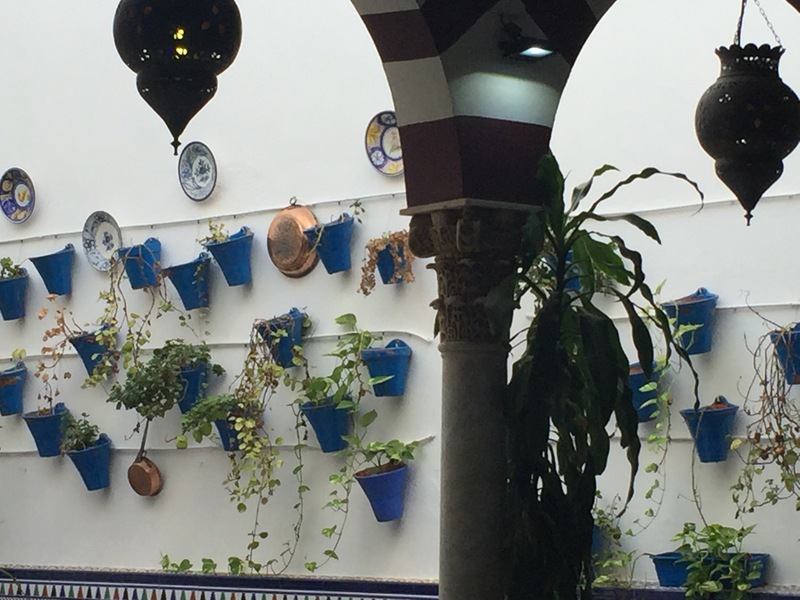 Raquel is quite fond of the layout and design in these particular sections of town and she had mentioned that in Córdoba the Jewish Quarter was respectively beautiful. It had happened again! 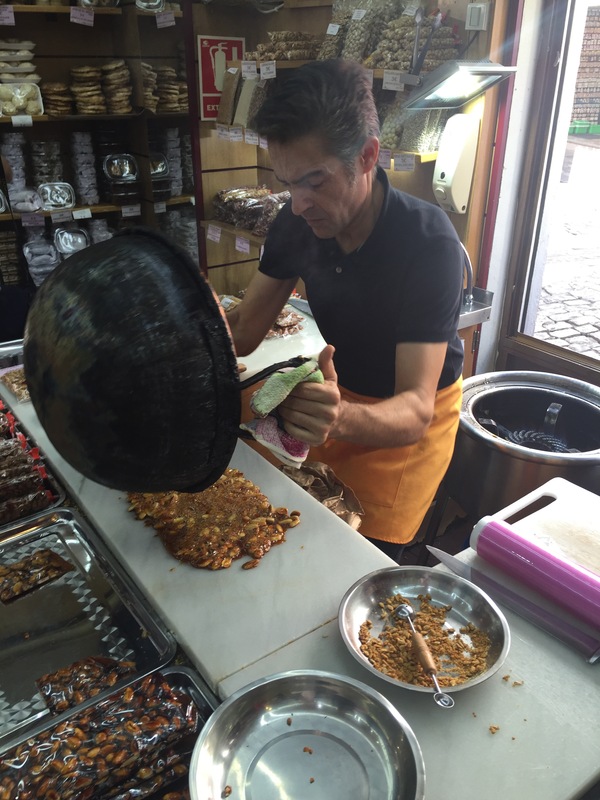 I was just walking down the street and I stumbled upon this candy maker! 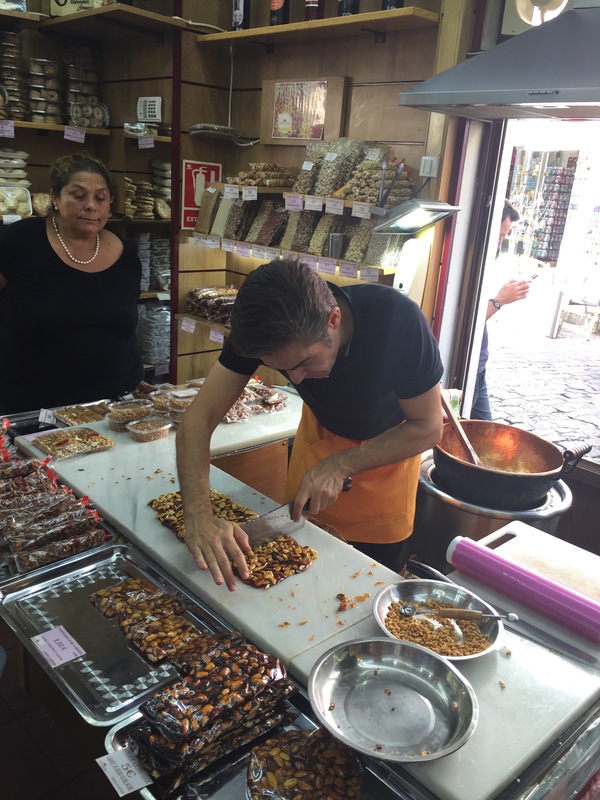 Roman Ruins/Candy maker-equally as important!! I stayed in this store for over an hour observing this candy man! It is a true art and he has it down to a science. Needless to say, I took home a big strip wrapped in plastic wrap. 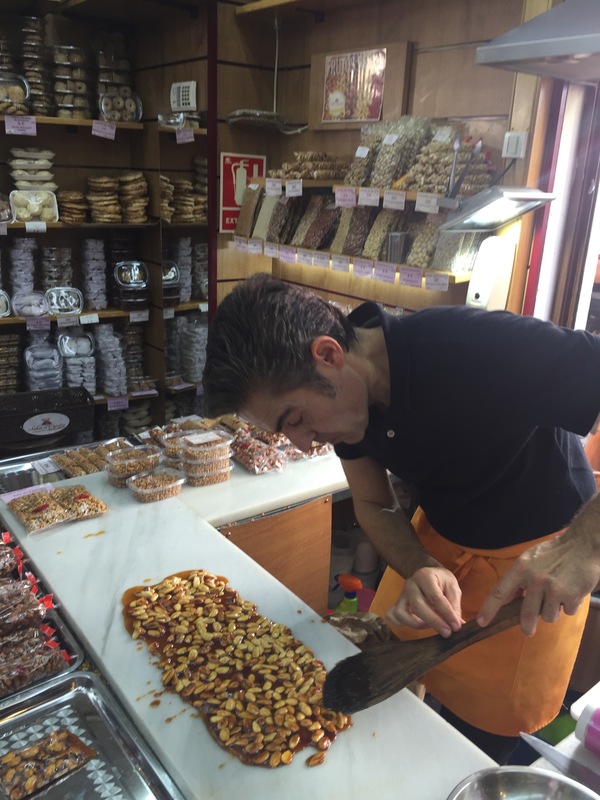 I sampled ‘Mantecados’ which are little bread desserts made from pork fat given to us from the Christian Heritage and now this ‘almendras caramelizades or garrapinadas’! The second dessert was from Arab influence. Both equally delish!!! I than head towards ‘Puerta del Puente’. And than over the ‘Roman Bridge’ I go as I head towards the ‘Mills of the Guadalquivir’. 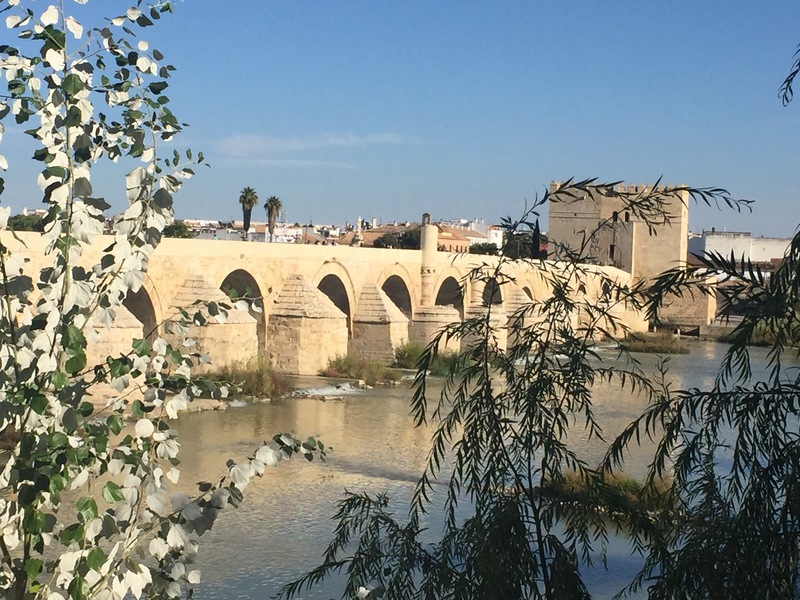 The Roman Bridge of Cordoba. 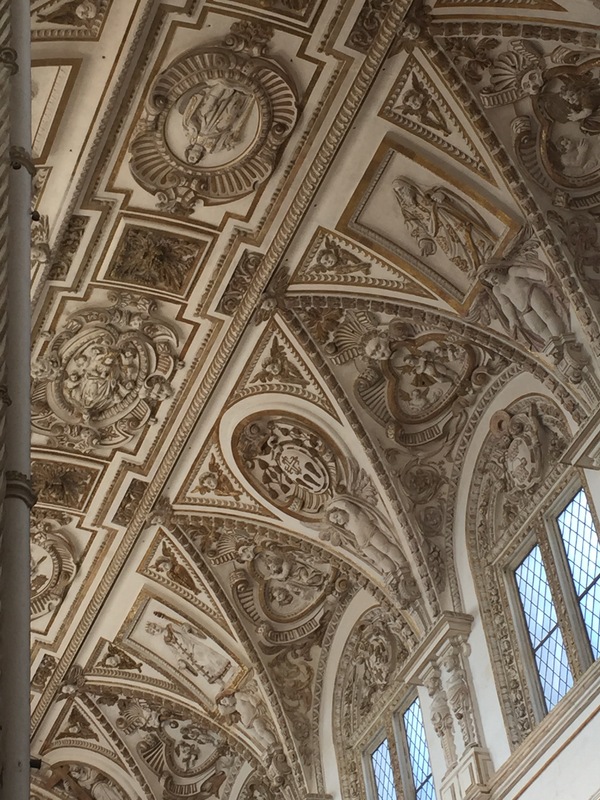 The ‘Mills of the Guadalquivir’ are moorish era buildings that took advantage of the water force to grind flour. And, all of this is beautiful. 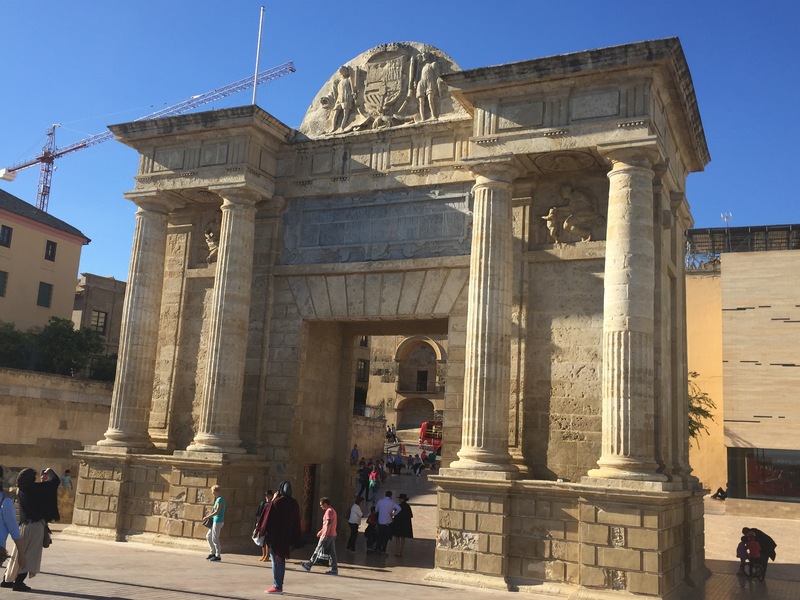 The ‘Puerta del Puente’ or ‘Gate of the Bridge’ was built simply because in the 16th century, the authorities decided that the city needed a new door. 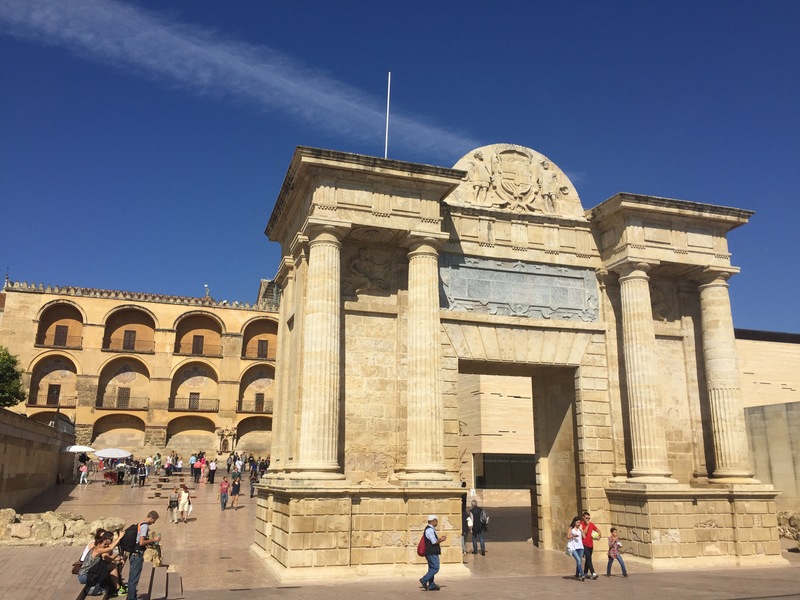 Surrounding the large old town Córdoba are Roman walls which I find myself walking in and out of all throughout the day. 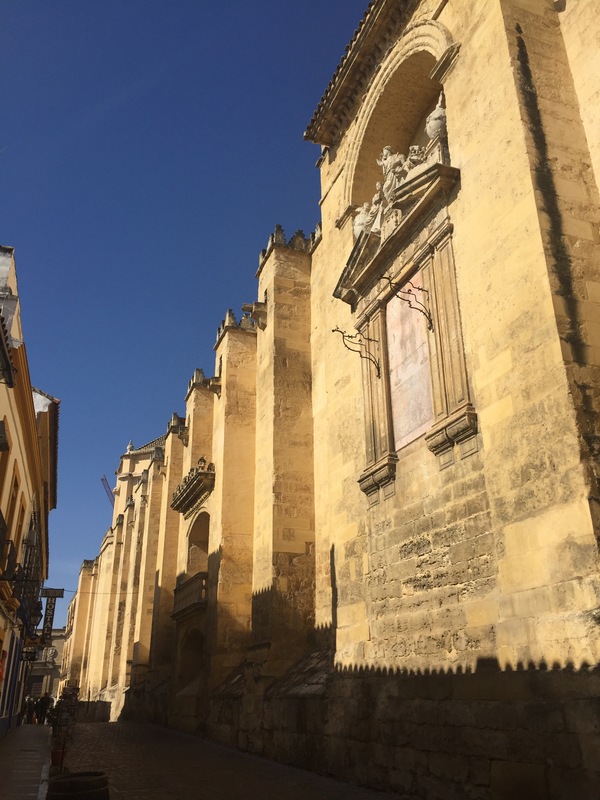 Córdoba is home to 12 Christian churches (many as transformations of mosques) that were built under Ferdinand III of Castile. I stopped and visited several of these churches lighting candles for my loved ones as I roamed the beautiful streets of Cordóba. Ruta de Patios del Alcázar Viejo. 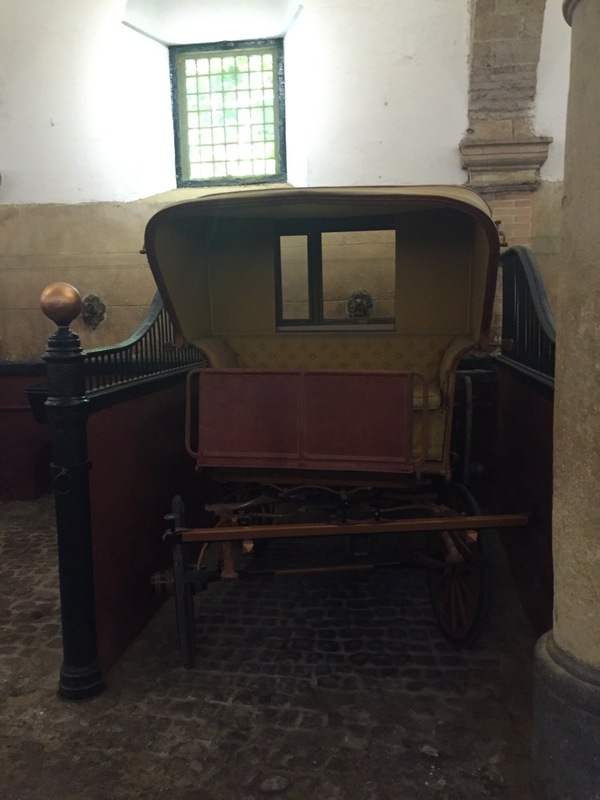 The Royal Stables of Cordoba. King Philip II, who was a great lover of horses, set out on a scheme to create a pure thoroughbred Spanish horse. And for this reason in 1570 he ordered the Royal Stables to be built. 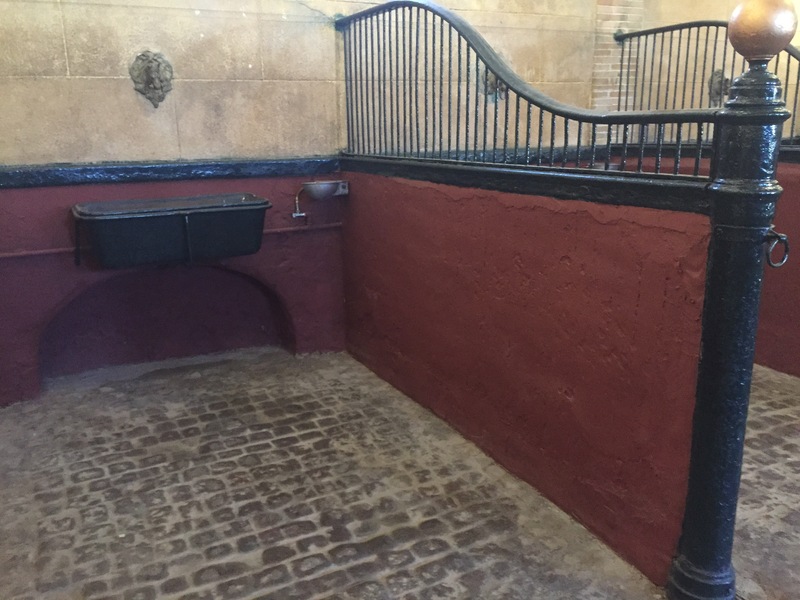 It was in this magical setting where he bred the Spanish horse known as Andalusian horses. I headed towards the train station stopping to purchase some ‘castaña’s’. And, I was back at Gloria’s in no time at all. When I arrived back home, Gloria and Monica were watching a Sevillana dance competition. And, this is beautiful and such an art. We’ll talk about this another day!